Carol Acquilano works with many different mediums in her Anderson Alley Artists studio. 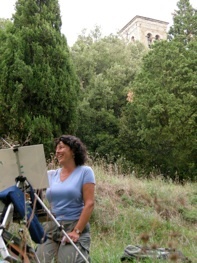 She paints, sketches makes prints, binds books and is an avid en-plein-air painter. Her work is expressionistic of her surrounding environments. Through her work she encompasses both dream like and grounded states that resemble the intangible places that capture one’s imagination. Acquilano graduated from the four year Diploma Program at The School of the Museum of Fine Arts in Boston. She is an exhibiting member of Rochester Contemporary, The Print Club of Rochester and The Boston Printmakers. Acquilano also teaches fine arts at SUNY Empire State College, and has been a member of the curatorial team at The Memorial Art Gallery of the University of Rochester since 1990.